Before this review begins, I would have to identify myself as a true fan of the world created by J.R.R Tolkien. I read the books when I was very young (about 11 or 12) and enjoyed them enough to then get the books outside of the immediate story of the rings. For a period of time, I was an encyclopaedia on Middle Earth and as such I was truly looking forward to playing this title. Imagine my delight when receiving this title to start the review! Imagine my disappointment when things turned out to not be as good as I was expecting. The game it must be said, is extremely faithful to the book and does give Tolkien aficionados the chance to explore the wondrous world that he created so many years ago. And that's about where the good points of the game begin and end. 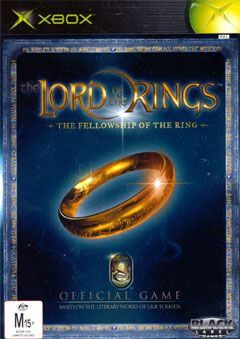 Graphically the title is not a total let down and it was pleasing to see the opening cut scenes between Frodo and Gandalf and then start the game in Bag End after Bilbo has departed and left the one Ring in your care. You can see around Bag End and the amount of detail truly shines through. Then you get Frodo to go for a wander and the game starts unravelling at the seams. It's at this point that players will realise that appearances can be deceiving and the game doesn't offer up too much as far as texturing or taking advantage of any other abilities of the XBox to make it stand out from the other consoles. Framerate problems abounded for me to the point that it seemed that in some places Frodo was limping about his home, that's how bad it was. It was as though animation frames were missing from his walking although after checking later, he was walking normally. 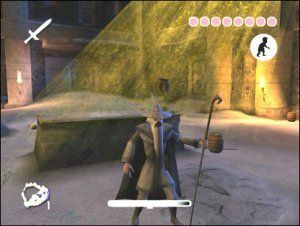 It seems that the developers had trouble maintaining a decent draw speed whilst maintaining the cpu's ability to animate the characters and surroundings. This did not improve when going outside or in any other environment. This did not change when playing as Gandalf or Strider (you take control of these characters later). A neat touch to the game is the inclusion in sidequests that will draw you further into the game world. However, if you plan on doing all of them, realise that you are going to take a long time to even leave the shire. I played within the Shire for about two and a half hours. These involve little tasks that Frodo can carry out for other Hobbits and will usually result in some sort of reward when completed. 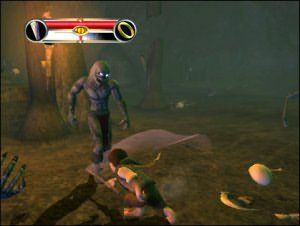 The artificial intelligence displayed in the game is also substandard to the point that although Frodo can sneak up on creatures using his stealth abilities, it really didn't matter as I simply ran up and hit them quite a few times before even the slightest reaction was noticed. At one point in the game, to further test my disappointment, I ran up behind a Black Rider and jumped up and down and then threw stones at him as his back was turned. The creature didn't show any reaction to me whatsoever and then to add insult to injury, finally when he turned about and started to walk toward me, the collision detection on the game failed us totally and he got snagged on a tree root that should have been simply stepped over. This happened on many occasions during the game and not just with Black Riders. Non player characters from all species could not make their way around or over simple obstacles. It got to the point that it was all too easy. The sound on this title is sensational and a real credit to the legacy of Tolkien's story. The game soundtrack does approximate that of a feature film and the voice acting is the best I have heard within a game for quite some time. Weapons and creatures are done justice and the title in general is well served as far as audio goes. So there is a ray of light in this tale after all. Despite all the side missions, the game is linear in order to follow the progress of the book and I felt like it was overreaching itself to capture the scope of the book, eliminating the beauty of Tolkien's prose into a matter of seconds instead of fully doing the written word justice. 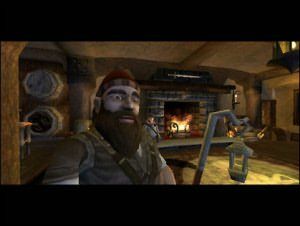 I do appreciate the memory constraints of such an effort however it seemed that passages that were worth fully incorporating in the game were mine stripped to retain a fairly shallow essence of storyline. The controls are the same for all the characters and quite frankly their appearances are a let down. Gandalf looks like some sort of munchkin wizard taken out of the template guide for wizard design, and Strider looks as though he is some sort of generic hero type character. Textures on characters are lacklustre as is the general appearance of most levels with flat, uninspiring colours dotting the landscape. Don't get me wrong, Fellowship of the Ring is packed with details to look at and appreciate, but it's as though the left hand wasn't talking to the right most of the time. It was as though one part of the development team had stood back admiring their work only to hand it over to a bunch of monkeys who then screwed it up. I honestly believe that the team's heart was in the right place and all efforts were made to do the book the justice it deserved, but unfortunately glaring errors made the possibility of an enjoyable experience practically impossible. In summary, I heartily recommend you rent this game before buying it as it's not going to appeal to everyone and the inherent flaws in the game will readily become obvious. I could have gone on in some more detail about other unsatisfactory parts of the game, however I believe that I have made my point. Please try before you buy. If you are serious about purchasing this game and renting first, get out of the Shire as quick as you can, just so you can make an informed decision about your purchase.